Honda introduced a pair of progressive customs that fuse tradition with groundbreaking new ideas and perspectives while providing ample scope for owner customization. Offering a fresh take on custom cool, the Rebel 500 and Rebel 300 mix old- and new-school style and are engaging and fun to ride, with an outlook geared toward firing the imagination of a younger generation of riders. Development for the Rebel 500 and Rebel 300 began in the U.S., with the objective of referencing a timeless look while also introducing a forward-thinking, contemporary style all their own. Accessible, fun to ride and easy to live with, the models go their own way but are also blank canvases, ready for whatever their owners’ imaginations have in store. 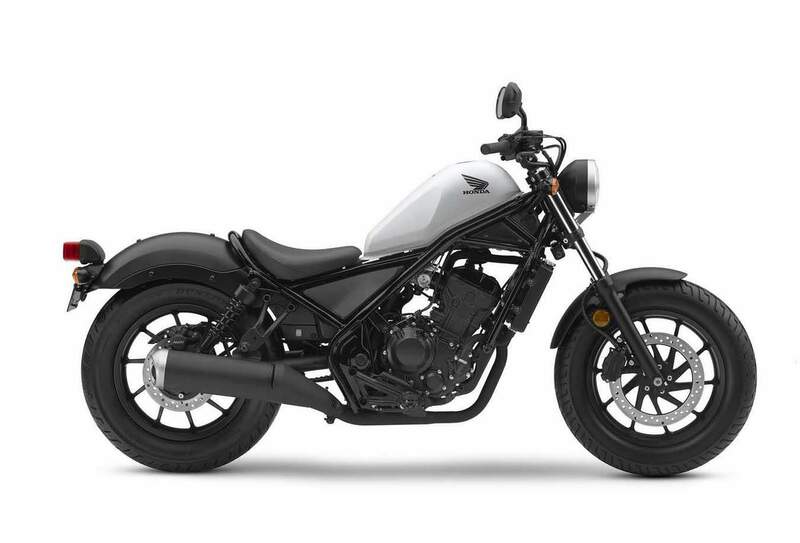 Simple and raw, Honda’s new Rebel models are exercises in straightforward, minimalist design where every detail matters. Low, lean silhouettes are crowned by iconic fuel tanks, aggressively raked front ends and fat tires on large-diameter wheels, along with a stamped-steel rear fender and narrow frame body, resulting in stripped forms that express offbeat individuality from every angle. The evocative round, glass headlight sits up high in a die-cast aluminum mount, the speedometer is a compact dial with negative LCD display and blue backlight, and the ignition is housed below the left side of the fuel tank. Everything that can be is blacked out. With a 471cc parallel twin, the Rebel 500 has strong bottom-end torque and a smooth, linear power delivery, while the Rebel 300 is powered by a peppy 286cc single cylinder engine. In both cases, the bikes’ riding positions are relaxed and neutral, with arms gently outstretched and feet dropping straight down to the mid-mounted pegs. 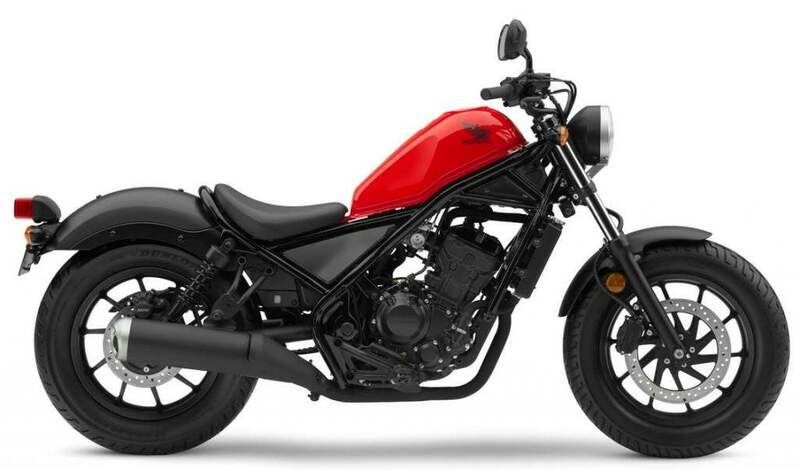 The versatile Rebels are fun to ride slow and fast, great for day trips, jaunts to the coffee shops or even sporty sessions on winding roads; low weights, slim frames and short seat heights equal agility at lower speeds, whereas good ground clearances allow surprisingly sporty lean angles. Both the Rebel 500 and Rebel 300 are available in standard and ABS versions. 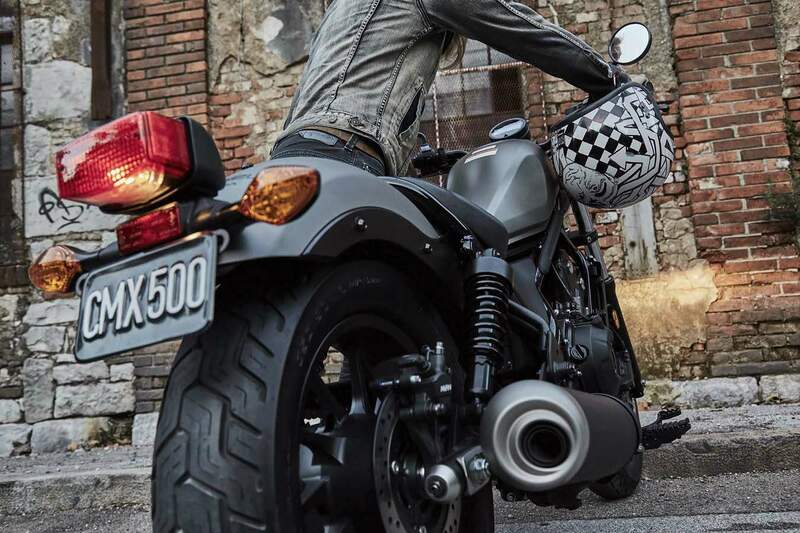 Twin-cylinder engines are a great choice for a machine like the new Rebel 500. 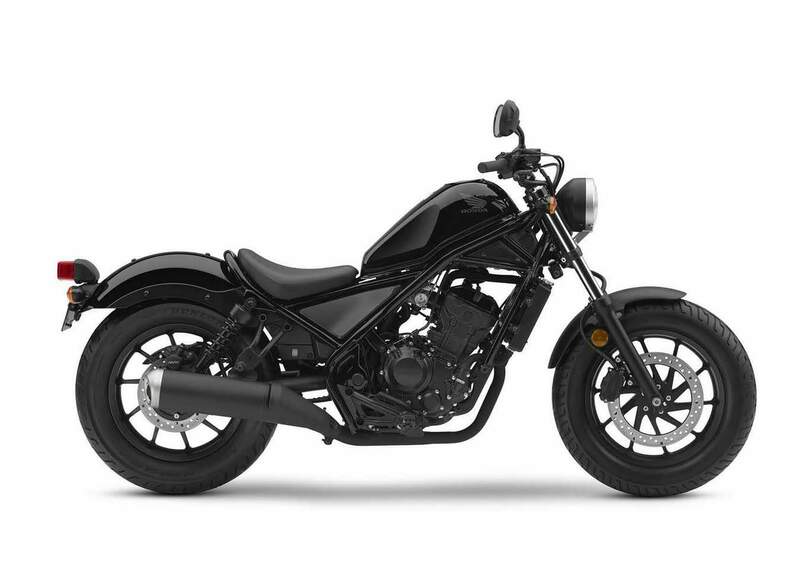 Honda twins are famous for their versatility, and the 471cc Rebel 500’s engine is one of our best ever. The parallel-twin engine is narrow, which helps reduce overall bike size. Plus it offers lots of low-rpm torque, but plenty of higher-rpm performance. The new Rebel is a blank canvas for your self expression. But unlike the canvas you buy at the art store, this one’s not boring white. As is, its black-out engine pieces, frame, and bodywork elements look great during the day and even better at night. When it comes to seat heights, almost everyone likes them lower. At just 27.2 inches, the new Rebel has one of the lowest seats in anyone’s lineup. It’s comfortable when you ride, and it makes it easier to flat-foot it at stoplights or in parking lots. A lot of today’s motorcycles look great standing still, but disappoint once the road gets twisty. 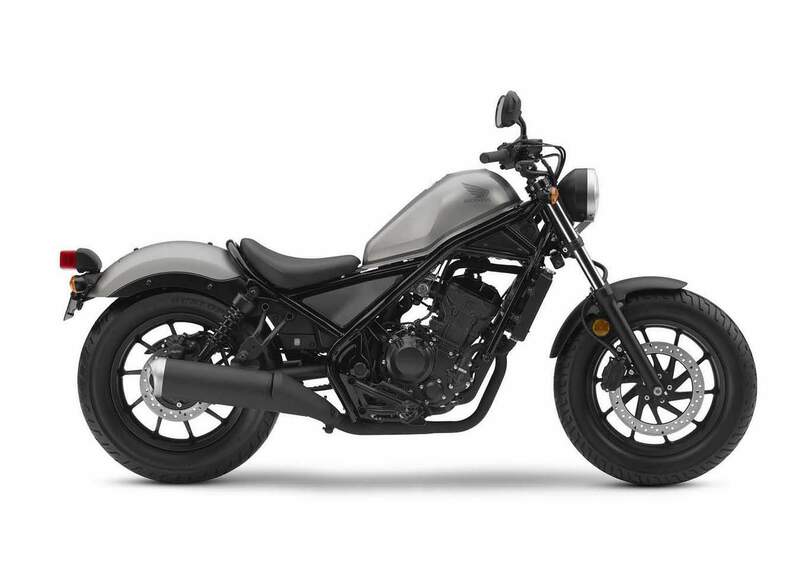 At Honda, we set high standards for the way all our bikes handle and feel, and the new Rebel is a perfect example—we’ve paid just as much attention to the way this bike corners and handles as we have its knockout styling. 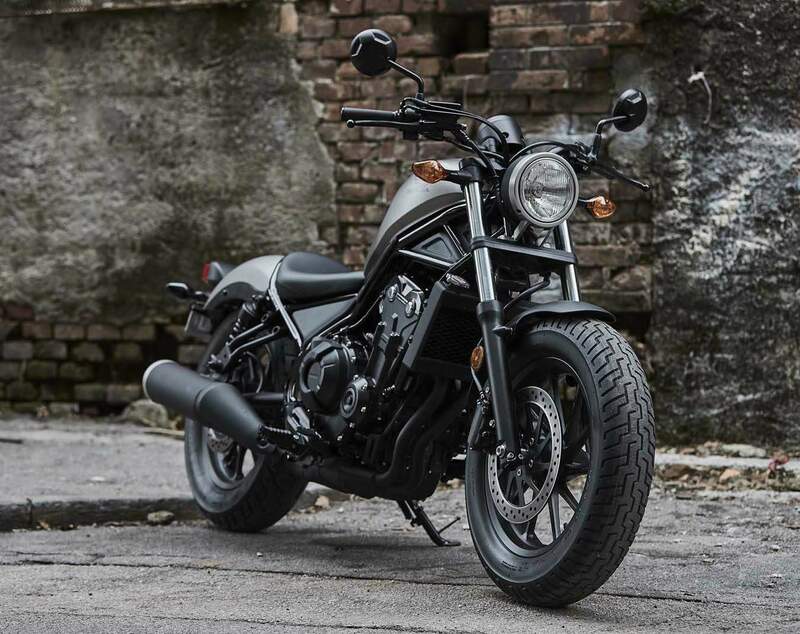 Honda engineers tuned the Rebel's engine and exhaust system to perfectly suit the cruiser riding style, resulting in strong low-end torque, a wonderfully smooth powerband, and an ear-pleasing sound. The DOHC liquid-cooled parallel-twin engine uses a square bore & stroke of 67 mm x 66.8 mm for an optimum combination of strong low-end torque and horsepower and excellent top-end performance. Engine vibration is kept to a minimum by using crank pins phased at 180 degrees and a balancer shaft behind the cylinders, which also contributes to the engine’s compact size. PGM-FI electronic fuel injection keeps the engine running efficiently in all conditions and ensures crisp throttle response. A light and compact roller-rocker-arm assembly and shim-type valve adjustment allows a lower valve-spring load for reduced friction and a compact cylinder head. And to ensure precise cylinder shape, the engine uses the same centrifugal-cast thin-wall sleeves as found in the CBR600RR. The Rebel's six-speed transmission works in concert with the engine's broad powerband to make getting going from a stop easy, while also ensuring strong performance and excellent fuel economy during highway cruising. Combining elements of bobber and chopper styling in its iconic fuel tank design, narrow frame, raked-looking front end and black-out components, the Rebel has a raw, no-nonsense appearance that’s bound to get noticed. The Rebel’s low 690 mm (27 inch) seat height allows most riders to easily put both feet flat on the ground at stops for added confidence. Want to bring a friend along? The optional passenger seat installs easily. Oversize tires (130/90-16 front; 150/80-16 rear) help to contrast the narrow frame and add to the Rebel’s strong, confident stance. Front and rear disc brakes provide confident stopping power, or step up to available ABS for the ultimate in braking performance and peace of mind. Dual side-mount shocks and the raked-looking fork provide a retro look, but thoroughly modern comfort and handling. Chopper-style fuel tank looks compact, but its 11-litre capacity combines with the engine’s excellent fuel efficiency to let you ride far and wide between fillups. LCD instrumentation keeps you up to speed on your progress and the engine’s operation. The side-mounted key location adds to the Rebel’s retro character. A collection of custom-designed Honda Genuine Accessories – including windscreen, saddlebags, rear carrier rack, and more – let you create a Rebel that’s uniquely your own. •Both models' riding positions are relaxed and neutral, with arms gently outstretched and feet dropping straight down to the mid-mounted pegs. •Good ground clearances allow surprisingly sporty lean angles. •To support the Rebel's low-slung look, its attractive tubular-steel frame holds the engine in three places and is designed to be as narrow as possible around the rider's inseam. Trail is set at 110mm with 28° rake. •The 41mm fork stanchions are set wide at 230mm apart for handling rigidity, comfort and style, and the lower legs are blacked-out. •Fork angle is 30°, wheelbase is 58.7 in. wheelbase and seat height is 27.2 in., resulting in balanced, neutral steering. •Frame body has a narrow shape and includes an innovative rear loop that separates the seat from the stamped-metal rear fender. •Dunlop tires (size 130/90-16 front, 150/80-16 rear) are mounted to 16 inch cast-aluminum wheels. •Both the Rebel 500 and Rebel 300 are available in standard and ABS versions. •Iconic peanut-shaped fuel tanks, aggressively raked front ends and fat tires on large-diameter wheels result in stripped forms that express offbeat individuality from every angle. •Blacked-out 45mm tubular swingarm with twin conventional, side-mounted shocks that feature two-step preload adjusters. •Evocative round headlight sits up high in a die-cast aluminum mount. •Speedometer is a compact dial with negative LCD display and blue backlight. •Ignition is housed below the left side of the fuel tank. •Rebel 500 is powered by a 471cc, eight-valve, liquid-cooled parallel twin with strong bottom-end torque and a smooth, linear power delivery. •Rebel 500 cylinder head uses roller rocker arms; shim-type valve adjustment allows them to be light, for lower valve-spring load and reduced friction. •Rebel 500 has a silent (SV Chain) cam chain, with the surface of its pins treated with Vanadium to reduce friction through its increased protection against dust. Inlet-valve diameter is 26.0mm with exhaust-valve diameter of 21.5mm. •Rebel 500 has reduced friction through the addition of striations on the piston skirt (a finish that increases surface area, introducing gaps in which oil can flow for better lubrication). An AB 1 salt bath process, used after isonite nitriding, forms a protective oxidization membrane. •Rebel 500 crankshaft pins are phased at 180°, and a primary couple-balancer sits behind the cylinders, close to the bike's center of gravity. The primary and balancer gears use scissor gears, reducing noise. The crank counterweight is specifically shaped for couple-balance and its light weight allows the engine to spin freely, with reduced inertia. •Rebel 500 crankcases use centrifugally cast thin-walled sleeves. Their internal design reduces the "pumping" losses that can occur with a 180° phased firing order. A deep oil sump holds 3.2 liters. •Rebel 300 is powered by a peppy 286cc single cylinder engine. •Six-speed gearbox is designed to offer effortless changes. •Blacked-out mechanical components for a tough, minimalist look. •Specially designed muffler looks good and emits a pulsating exhaust note.